Match up for the 52 SUPER SERIES title? Summer officially ended today in Valencia. Well, that’s what it appears with some light rain falling this morning over the Marina Real Juan Carlos and very overcast skies. The rain is forecast to clear before midday but the winds will be pretty light through this second day of racing at the Audi Valencia Cup. Forecast suggest around 7-9kts from the SE but first thing the AP flag has been up and there is a postponement ashore. Intentions, as ever, will be to get as many races away today as possible, given that the breezes are expected to remain light. At each start yesterday flurries of match racing activity broke out between the top two title contenders for the 52 Super Series win, Quantum Racing and Audi Azzurra Sailing Team. Since they lost out on the start to the final race inSardinia, falling prey to Quantum Racing’s slightly more aggressive pre-start moves, Audi Azzurra Sailing Team have changed helm for the starts. Now Francesco Bruni, who is an accomplished match racer in his own right, steers through the start. And yesterday the blue boat was slightly better off the line in two of the three starts. Of courseValenciahas a very strong connection for Ed Baird, the multiple world match racing champion who won theAmerica’s Cup as helm for Alinghi in 2007. We finished preparing this boat here when it was brand new, using the Swedish base at the time, and we did some sailing here then and some work on the boat. But this is the first time back to be racing. This is one of the places which is very sweet in my past and it is very nice to come back here. It is going to be an exciting battle to find out who comes out on top. particular advantage here. We just have to go out and sail good races. this event which conflicts with this. And so we have Justin Slattery up on the bow. They are all great guys but it never helps to spend more time in racing situations to get better. I think they want to beat us and they want to beat us. As for match races? Well I think the lighter and shiftier it gets then you cant worry about one guy. It will depend a lot on the conditions just how ‘interesting’ it will be. 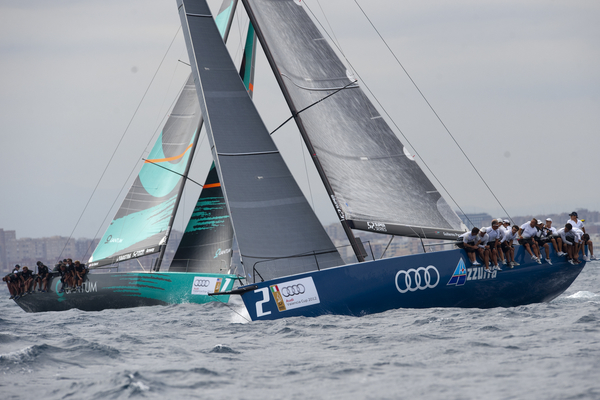 News Overview Audi Azzurra Sailing Team, leaders of the Audi Valencia Cup RACE 4: Azzurra, again!